Beautiful place, wonderful warm welcome, superb breakfast everything we could wish for and more. Would definitely go back and would highly recommend. This was the best B & B we stayed in while touring Ireland. Upon arriving, we received a very warm welcome and were served tea and refreshments. The hosts were so helpful in providing information as to where to go and places of interest. They even packed a picnic basket for us for our lunch during our travels. Breakfasts were delicious and we were offered a wide variety. What can I say about this fantastic place. 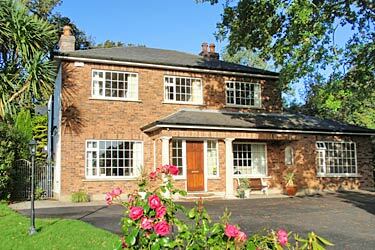 Oaklands B&B is the finest example of true Irish hospitality. Truly was one the nicest places we've ever stayed. Winifred our hostess, couldn't do enough for us to make our stay comfortable and enjoyable. We will definitely recommend this to our friends. Thank you much Winifred. Dear Winifred & family including dogs: Just wanted to tell you we were most happy plus comfortable in your place... The veranda onlooking your wonderful garden is my wife's dream... If we come back for Margie's craft networking we will be delighted to meet you... By the way, we are already applying your gardening tips! All the best Margarita & Manuel GARDENES P.S. : we do recomment your place 100%!! If you ever want to go to County Cork. Take a stay at Oaklands. We spent wonderful day in Oaklands. Mrs. Winifred O'Donovan did help us with good hints for travelling. We had an excellent room and a delicious breakfast. It is a quiet location and excellent for covering the SW of Ireland. If we come back to Ireland, we will have a stay in this house. Winifred, thank you for all your help and all the fun we had together! Absolutely lovely people running the place, warm welcome, good rooms, well looked after, good breakfast. We enjoyed our time at Oaklands very much and recommand it to everyone. Our favorite B & B while traveling for 2 weeks through Ireland and Scotland. We were treated to a wonderful breakfast in a marvelous setting and sent out for the day touring with a picnic and GPS to help us with our travels. This was a great hub for traveling through the southern counties. really excellent place, very nice and kind landlords!!! Oaklands is situated in a very peaceful and quiet area only a 7 minute walk from the train station and 15 minute's stroll from the town center or bus station. The rooms are clean, spacious and comfortable, the wonderful garden is in full view from the brightly glassed breakfast area and the hosts are lovely, helpful and very friendly people. We'd always stay there again when we come past Mallow.